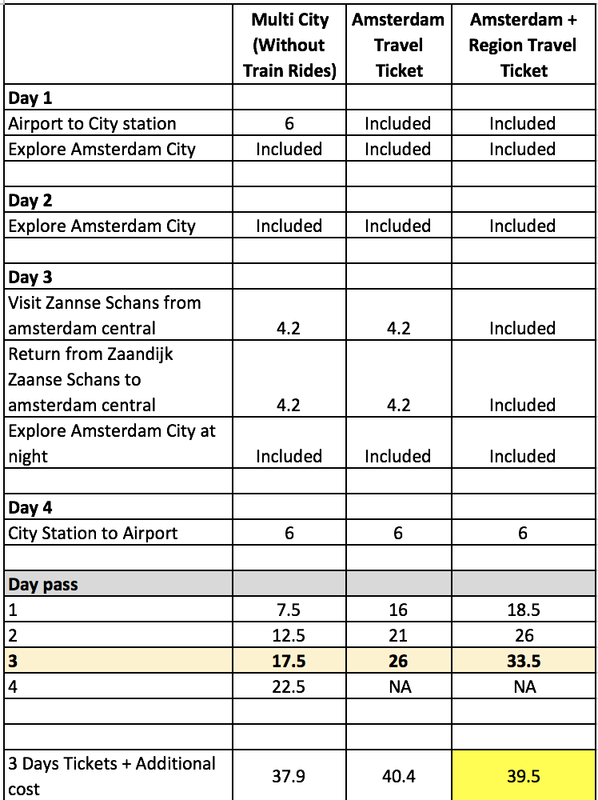 Home Amsterdam Amsterdam & Region Travel Ticket Amsterdam itinerary iamsterdam card Netherland Transportation in Amsterdam travel pass travelling in amsterdam Amsterdam - Which Travel Pass to get in Amsterdam? Amsterdam is a beautiful city. With gorgeous looking building over the canal and museum, the city has a lot to offer. 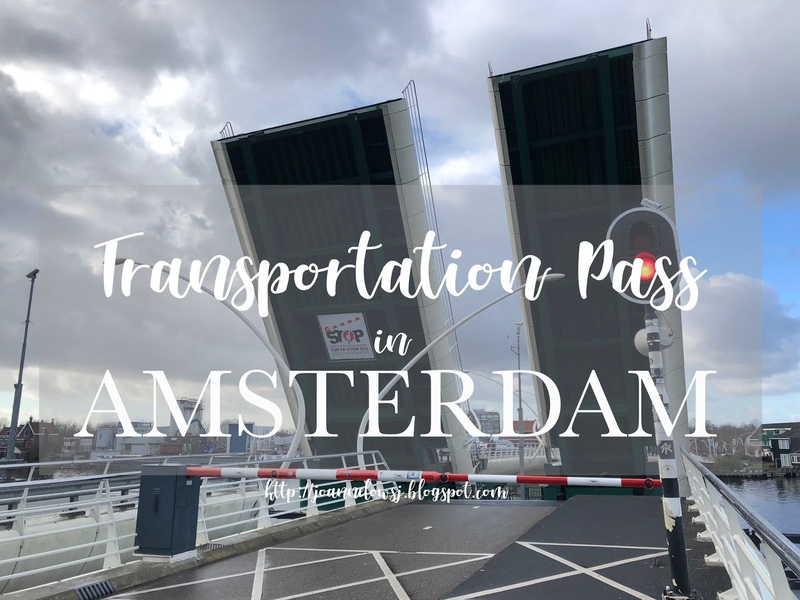 If you hop over from my calculation and views on Iamsterdam card, you probably know why we recommended getting the transportation pass instead of the pass. In Amsterdam, the GVB tickets are sold by hours - 1 hr ticket at €3 and its only valid on GVB trams/metro/buses and not on Trains. So most visitor who travels a lot in a day will get a day pass. Below are the different type of passes available for sale. 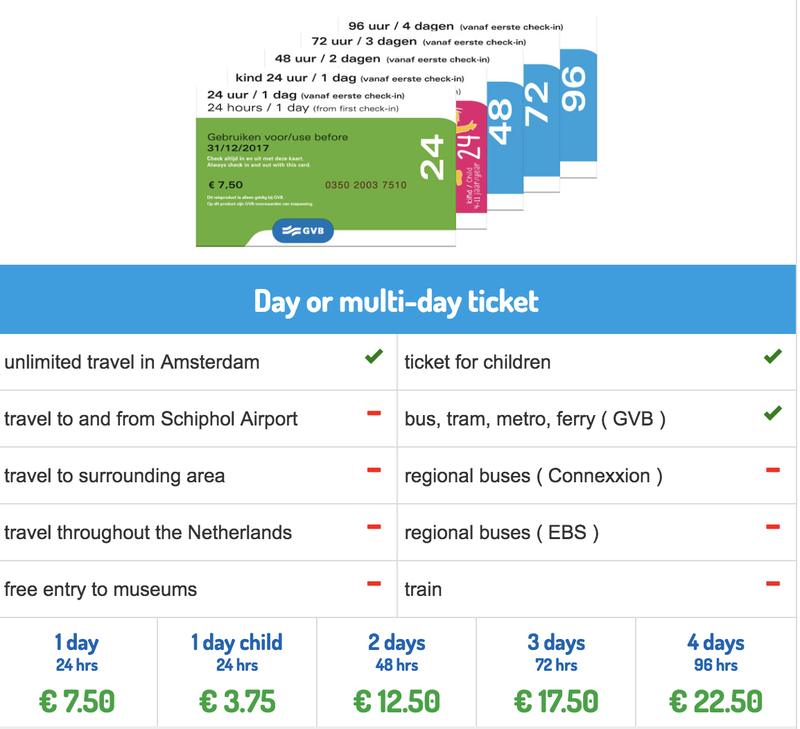 This ticket includes unlimited travel throughout Amsterdam on all GVB trams, buses, metros and ferries. It seems like a pretty good deal at first but I wouldn’t recommend you to get it if you are coming from the airport. The multi-day ticket does not include train rides and regional buses of Connexxion and EBS. Yes, we didn’t do much homework on the Amsterdam transportation until we got there. The tourism help desk didn’t bother to entertain us either. In another word, if you are coming from the airport, this pass does not include the ride from airport. Also, if you are planning to do a few sight-seeing, I would recommend you to take the train. It is way faster than tram and more accessible to most attractions. 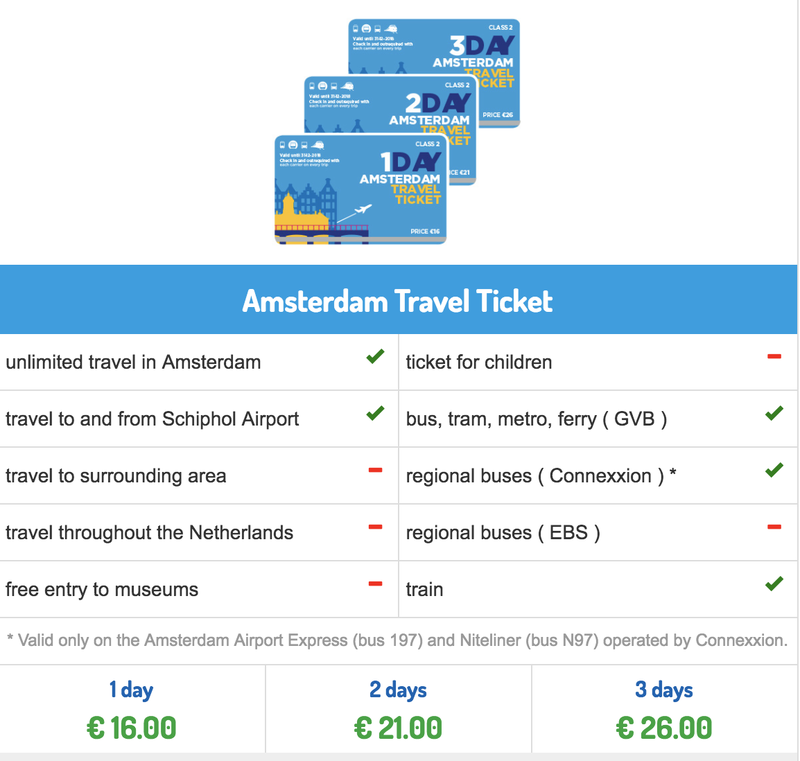 This ticket is most suitable for travelers who plan to stay in Amsterdam city. It includes train ride from the airport to any train station in Amsterdam. Plus, it includes unlimited rides for the GVB trams, buses, metros, ferries and Train rides. Do note that the ticket is not valid on buses operate by other company such as EBS, Arriva and Amsterdam Airport express (197) and Niteliner (bus N97) operated by Connexxion. Also, the tickets does not include trips to surrounding area such as Zannse Schans. This ticket is probably the one we thought we should get on our first day. Since we already had plans to visit Zannse Schans, it makes so much sense. Plus, it includes regional buses such as Connexxion and EBS. I still remembered one of the night we board a regional bus that is not covered by the Amsterdam GVB pass. The bus captain was kind enough to let us board. 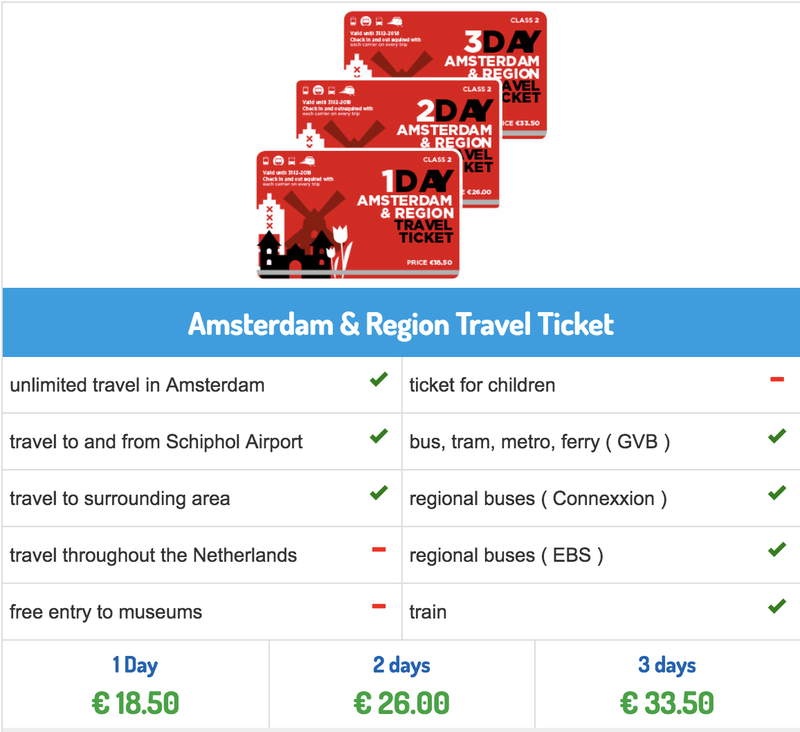 With all the number going into the spreadsheet, it makes more sense to purchase the 3 days Amsterdam + Region Ticket and a 1 way trip to the Airport on our last day. So which pass should you get? I think it all goes down to what you are planning to do and how many days you are planning to stay in Amsterdam. You can use the link below to help you calculate your estimated transportation cost and if it is worth buying the pass! If you are planning to stay long in Amsterdam, perhaps getting the OV-Chip card is better. I hope this helps!